Traveling west from Prince George you will pass through rich open country, spruce, pine and fir forests and near spectacular serene lakes. Shortly after leaving the city you will pass Bednesti Lake and Cluculz Lake. At Houston you will see the Hazelton Mountains. 87 km (54 miles) from Prince George is a cairn marking the geographical centre of British Columbia. Forestry and agriculture are the main industries of this service centre. Vanderhoof is located on the Nechako River, 97 km (60 miles) west of Prince George. Visit the Vanderhoof Heritage Village Museum on Highway 16 at the west end of town, 11 reconstructed buildings from the 1920's or the Vanderhoof Bird Sanctuary on the river. Nearby Fort St. James is located on Highway 27 north off of Highway 16. One of the first fur trading posts in the province, Fort St. James was founded in 1806 by Simon Fraser. 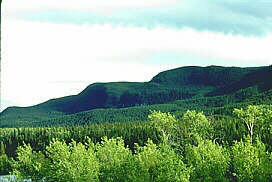 It is located 62 km (38 miles) north of Vanderhoof. This restored Hudson's Bay Company fur trading post on Stuart Lake is a designated National Historic Park. Junkers W-34 Replica in Cottonwood Park: this park commemorates early bush pilots and the region's early aviation history. Located northwest of town, this two- to four-day hike takes visitors to an old forestry lookout with a view of Stuart Lake, rugged mountains and breathtaking valleys. Continuing north along the unpaved Mackenzie Highway you will pass through Manson Creek and Germansen Landing, both of which were founded during the Omineca Gold Rush of 1869-71. Further west along the Yellowhead Highway (Highway 16) is Fort Fraser, one-time a trading post founded by Simon Fraser in 1896, and the Beaumont Provincial Park. Further still is the village of Fraser Lake. 4 km (2.5 miles) west of Fraser Lake is the Francois Lake Road to Francois Lake and the Stellako River where anglers will find good fishing opportunities. Continue along past Endako and Burns Lake in the Lakes District.